« Celebrate “For the LOVE Boutique” ONE YEAR ANNIVERSARY With a HUGE SALE! 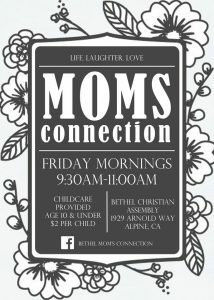 “MOMS CONNECTION”at Bethel Christian Assembly in Alpine! Mommas! We hope you join us for this upcoming fall season for “Moms Connection” Every Friday Morning from 9:30 to 11am. This time around, we will be going through the book, “The Five Love Languages of Children.” Check in starts at 9:15. Childcare is provided for ages 10 and under for only $2 per child! Come and enjoy some much needed “Grown Up” time. There is always snacks and coffee. See you there!